This gives native tribes little time to pursue legal action. To that end, the Army’s decision was based on available information that already supported approval for continued construction, referring to the easement as the final step that meets the tasks detailed by Trump’s order, consistent with the direction in the Presidential memorandum. 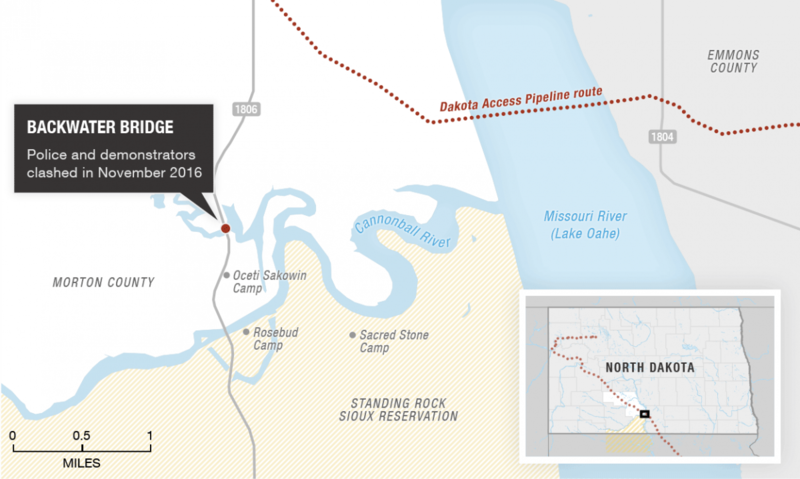 This essentially gives Dakota Access—the pipeline’s developer—right of way through government land at Lake Oahe Dam and Reservoir in North Dakota, where they intend to drill a horizontal hole under the Missouri River to allow a pipe to cut through. The new timeline gives the Standing Rock Sioux tribe and fellow advocates very little time to pursue legal action that will contest the legalities behind this new decision, with Dakota Access expected to begin drilling immediately. The pipeline runs across several states: North Dakota, South Dakota, Iowa, and Illinois. It is expected to move 470,000 barrels of crude oil daily. It is nearly complete, save for the section being contested under Lake Oahe. Source: North Dakota state government, Natural Earth, U.S. Census Bureau, USGS, Energy Transfer Partners, Bakken Pipeline Map, Carl Sack, staff reports. Opponents have warned that continuing construction of the Dakota Access pipeline would increase our use and continued reliance on fossil fuels, ultimately pushing back the momentum we have gained to focus on renewable sources. More importantly, an oil spill at this location will be an existential threat to the Standing Rock Sioux Tribe’s water supply—putting their way of life and culture at risk, as well as affecting the 17 million people who live downstream. The tribe, along with its allies, have protested against the pipeline for months. Many consider the new decision a show of outright disregard for the project’s impact, favoring instead President Trump’s corporate interests. In response, supporters tout the economic benefits the pipeline’s construction is set to bring. According to the developer, the $3.7 billion project will usher in over a hundred million in sales and income taxes to state and local governments, and open thousands of construction jobs. Overall, the move serves to highlight how different this new administration’s approach to environmental and energy issues will be compared to previous approaches.